A nice Citizen Chronomaster with the famous movement Eco-drive A060. 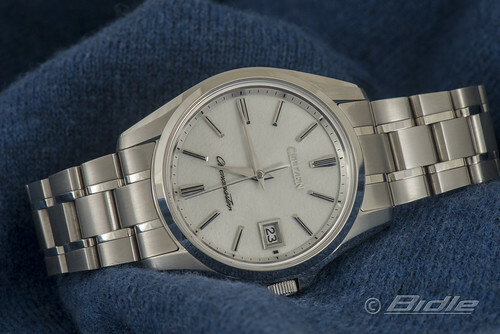 The watch is very nicely finished and definitely in the same league as the Grand Seiko's, maybe even slightly better. The dial is made from Washi paper, which creates a nice effect. On it a sapphire plate with the logo and the nice indexes. Another nice touch is that the watch is made of 'super titanium', so it is very light. Actual Citizen produced the first ever watch in titanium. A nice well made watch, which is easy to grab with it's perpetual calendar. I can recommend this AQ4020-54Y. Unfortunately hard to get outside Japan.